An initial report on a British Airways plane which caught fire at a Las Vegas airport suggests engine parts flew out and landed on the runway. The US’s National Transportation Safety Board (NTSB) said the casing around a key component of the engine had been found to have “multiple” breaches. The casing should contain any damage but spool parts, about 7-8in in length, were found on the runway. The most worrying aspect of this short, initial report is that it looks like the engine failure was uncontained. If an engine breaks, the casing is designed to stop any bits of metal flying out and damaging the rest of the aircraft, including the fuel tanks and critical wiring. Uncontained problems can be very serious. As for the part that appears to have broken, the high-pressure compressor spool, Dr Colin Brown from the Institution of Mechanical Engineers told me that it’s “most likely” to be from a “fatigue crack”. Dr Brown is an expert in fatigue crack growth in aircraft engines. Inspectors will now be looking at how new the part was and when it was last checked. If it’s relatively new, Dr Brown suggests they could ultimately ground aircraft with similar engines to check for similar problems. It’s still early days in the investigation – a final report could be months away. 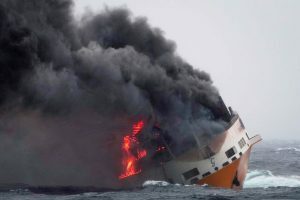 The fire forced the evacuation of 170 people on board on emergency slides. The plane’s pilot Chris Henkey, from Reading, has said he is “unlikely” to fly a scheduled trip to Barbados, after which he is due to retire. The plane’s flight data and cockpit voice recorders are now being examined by the NTSB, and the left engine is due to be shipped to experts to uncover what caused the fire. Flight 2276 was at McCarran International Airport, bound for London’s Gatwick airport, with 157 passengers and 13 crew members on board. The left engine of the Boeing 777-200 caught fire before take-off, and at least 14 people were taken to hospital with minor injuries. The NTSB report said: “Initial examination of the left engine revealed multiple breaches of the engine case in the area around the high pressure compressor. Mr Henkey told NBC he had been due to fly to Barbados on Saturday and return the following Tuesday, “and that would be it”, as he was due to retire.